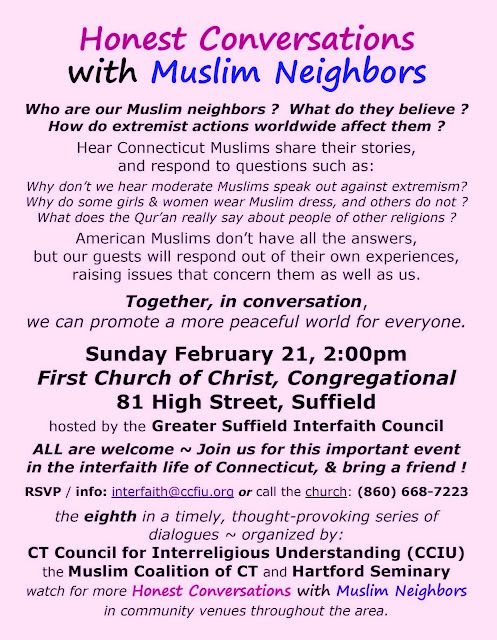 Hosted by the Greater Suffield Interfaith Council, this presentation is an an excellent opportunity to hear and discuss perspectives on the "spirituality of caring for creation and each other." Clarence Jordan, the faith leader who mentored Habitat's founder Millard Fuller at Koinonia Farm in Americus, Georgia, is often called Habitat's spiritual leader. His words on a sign near the door of the Koinonia Conference room of Habitat for Humanity International's Atlanta world headquarters caused me to pause before I entered. I was in Atlanta representing Hartford Area Habitat for Humanity this week as one of 14 Habitat affiliates across the U.S. teaming with Habitat International's Faith Engagement Department to make recommendations that could help expand Habitat's interfaith collaborations globally. Think of the impact collaborating faith communities could have sharing their common principles of welcoming and serving people in need -- the neighbor, the stranger, the marginalized, the vulnerable -- by working side-by-side to advance Habitat's mission: Seeking to put God's love into action, Habitat for Humanity brings people together to build homes, community and hope. Think of the impact collaborations could have in advancing the peace, understanding, and acceptance among different faiths when they come together to work in partnership for the greater good of the world. In Hartford, I've seen first hand the value of interfaith collaborations, whether organized by Hartford Habitat, the Connecticut Council for Interreligious Understanding, the Jewish Federation of Greater Hartford, the Muslim Coalition of Connecticut, The Conference of Churches, individual faith communities, or the many other organizations too numerous to mention. They all matter in bringing people together to listen, learn, understand, and accept each other, all focused on building a better world. The events and opportunities are everywhere, if only we care to seek them out. Photo by Don Shaw, Jr. Packed on the backs of yaks, that's how the wind-solar generating systems built by Hartford Public High School's Academy of Engineering and Green Technology students were transported on the final leg of their trek up to Nepal's isolated villages of Saldang, Namdo, and Karang. This week, Thinley Lhondup Lama, popular Nepalese actor and village elder, visited the Academy to personally thank the students, faculty and benefactors. I wish I could have been there. Supported by a collaboration of forward thinking educators, a generous philanthropist, and the backing of the business community, Academy students are Doing what others think is impossible, the motto on their Yakable t-shirt. This Academy program is education at its finest; academics applied to the real world. I had the honor of meeting many of the students and school leaders last year when I toured the on-campus shop where the power systems were built. Also, I can attest to the students' commitment to community service locally. Working side by side with them last fall, I saw their hard work first hand when they helped clean up and repair the Marshall House shelter's playground on nearby South Marshall Street. They made this commitment in partnership with the efforts of street residents, Hartford Area Habitat for Humanity, and the South Marshall Interfaith Coalition who are collaborating to improve the street's quality of life. To learn the details and impact of the Academy's exceptional program, please read Vanessa de la Torre's Hartford Courant article, Thank-You From Nepal. Also, Check out the video from NBC30's reporting of the story. "Governor Malloy announced today [February 18, 2016] at the State Armory that Connecticut has ended homelessness among the state's veteran population." So reads the lead sentence in a Partnership for Strong Communities and Connecticut Coalition to End Homelessness joint announcement about the success of Connecticut's Zero: 2016 initiative. "The Zero: 2016 initiative is part of a national effort to end veteran homelessness and chronic homelessness, the long-term homelessness of people living with disabilities, by the end of 2016. 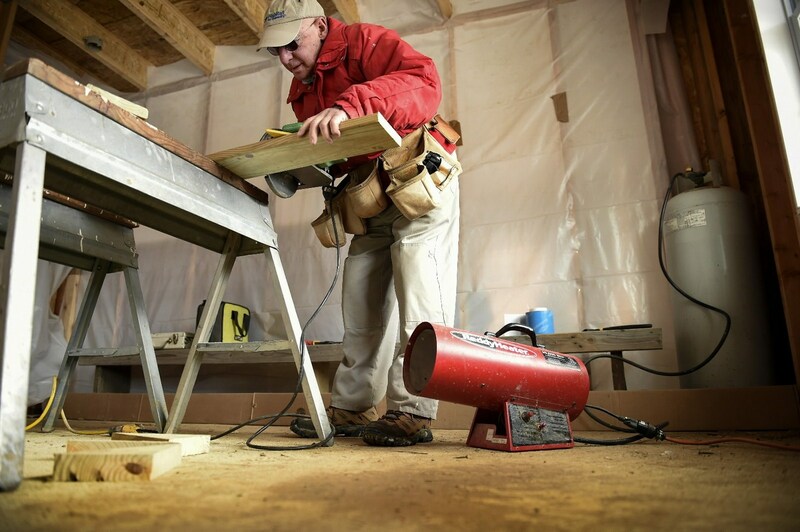 Connecticut is one of only four states accepted into the effort through its Reaching Home Campaign, the statewide campaign for preventing and ending homelessness in Connecticut." "“Ending veteran homelessness,” as defined by the U.S. Interagency Council on Homelessness, means that Connecticut has successfully developed a system whereby every veteran who experiences homelessness will be quickly identified and provided appropriate supports and housing." Tremendous commitment and hard work has led to this truly significant achievement, one to be very much celebrated. However, there is no doubt that much more work is required to reach all the homeless, and walk with them to a life changing opportunity. Read the joint announcement, and then read Susan Campbell's blog: "About that ending of homelessness in CT...". Her blog puts a real world context around this remarkable achievement. "Common Ground" is the headline of a story about Hartford's historic South End neighborhood embracing diversity -- diversity of culture, diversity of religion. It's about this long-time Italian-American neighborhood welcoming Bosnians who fled "a bloody civil war," and who now, as Bosnian-Americans, are renovating their mosque, the Bosnian American Islamic Center. Take a moment to read Hartford Courant reporter Vinny Vella's story published February 18, 2016. 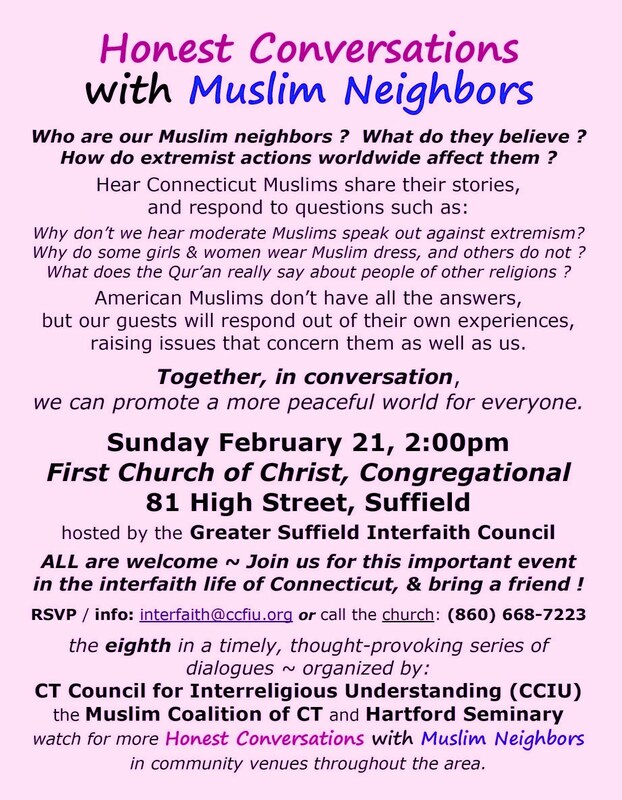 Hosted by the Greater Suffield Interfaith Council, this Conversation is an an excellent opportunity to learn more about our Muslim neighbors as they reach out to share their stories. To RSVP and for more information, please email the CT Council for Interreligious Understanding, or call First Church of Christ, Congregational at (860) 668-7223. Black history in Connecticut is long and rich with facts and stories we should acknowledge and understand. Connecticut Humanities has compiled more than 40 invaluable articles from its Connecticut History program archives that are well worth exploring and reading, especially as we celebrate Black History Month. The archive is arranged in a fashion making it easy to scroll through and identify stories going back decades. Take a look. Read and learn. Tony Cherolis is a pathfinder, a bicycling pathfinder, who directs Bicicleta y Comunidad (BiCi Co.) for Hartford's Center for Latino Progress. He's also the Center's Youth Program Coordinator, no small responsibility. I first met Tony on a Fair Housing Tour of Hartford's neighborhoods. 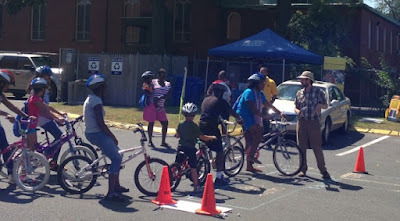 He was quick to point out that while many Hartford streets are bike friendly, many more safe biking streets are needed. He was equally excited to share BiCi Co.'s story, and its bicycling initiatives. BiCi Co.'s programs are aimed at improving "youth and adult bicycle safety, while increasing our community’s sustainable mobility and access to jobs in the City of Hartford." They address a critically needed option to travel about the city without depending on a car or bus. BiCi Co.'s programs range from Member Do-It-Yourself (DYI) repairs, to engaging more women in safe and fun bicycle recreation and transportation, to LIFE - HARTFORD!, an April Spring Break event at Heaven Skate Park. Of special note is the Earn a Bike Youth Program. Fixing a bike for our community and then fix a bike for yourself. Learning about bike repair from expert mechanics. Hands on! Learning the rules of the road and advanced bike handling skills. Getting a bicycle helmet, a bike lock, and lights. Bicycle lights, front and rear - Quality, weather resistant bicycle lights will be provided. Bicycle helmet - Proper helmet fit and importance of use will be part of the curriculum. Bicycle lock - The rider needs a secure bicycle lock and knowledge of how to use it properly. Retro-reflective stickers - to augment low light and nighttime visibility. A Bicycle - Each student that completes the course will obtain a general purpose bicycle. The bicycle will be tuned up, ready to ride, and sized to fit the student. It's a comprehensive program geared to getting youth on the path to safe and healthy bicycling. BiCi Co. is just one of the many vital Center for Latino Progress community programs, aimed at advancing "the socio-economic condition of the community at large, with emphasis on Hispanics, through education, training, supportive services, leadership development, and advocacy." You may discover the details of all the Center's programs on its website. 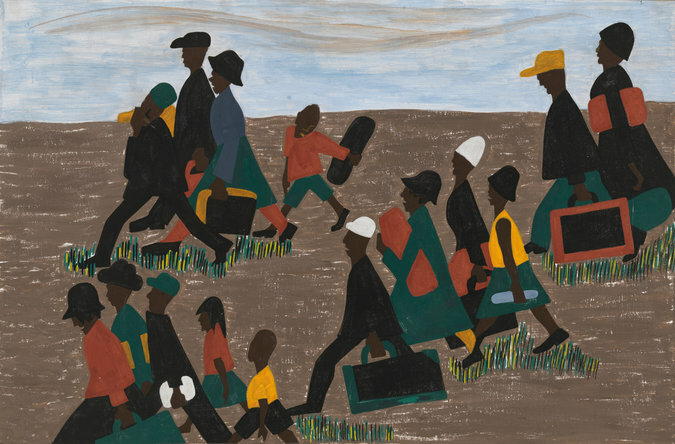 The Great Migration is a critical event in 20th century American history. It is the story of "the decades-long migration of black citizens who fled the South for northern and western cities in search of a better life. From 1915 to 1970, this exodus of almost six million people changed the face of America." Historian Jon Meacham notes that "...it is one of the most significant yet little-noted shifts in American history, a shift with an infinity of implications for questions of race, power, politics, religion, and class - implications that are unfolding even now." Emmitt Till and Tamir Rice, Sons of the Great Migration, Elizabeth Wilkerson's telling article [NY Times, February 12, 2016] is an insightful assessment relating how "African-Americans still haven't found the freedom they left the South for 100 years ago." This article is an essential follow-up to Wilkerson's Pulitzer Prize winning book, The Warmth of Other Suns: The Epic Story of America's Great Migration, a powerful account of the "...leaderless revolution that would incite six million to seek asylum within the borders of their own country." Wilkerson's book and article are must reads. Quotations are from Wilkerson's book and article, and Jon Meacham's comments. 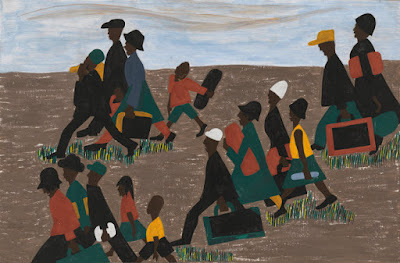 Jacob Lawrence's art appears with the article. If you care about race relations, I encourage you to to watch THE BLACK PANTHERS: VANGUARD OF THE REVOLUTION and draw your own conclusions. Powerful and provocative, it premiers nationally on PBS, Tuesday evening, February 16, 2016 (check local listings). Hear and see this history in the voices, pictures and videos of the allies and opponents who lived it during this highly charged and transformative time. After seeing it at Hartford's Real Art Ways on its national preview tour, I left the theater with a broader and deeper knowledge of those turbulent years. Producer Stanley Nelson, who spoke in a talk-back session after the screening, clearly wants this movie to help us learn, debate and understand how the Black Panther Party changed the race relations landscape. How we acknowledge and use this history to catch the stones thrown at or placed in the path of the marginalized, vulnerable, and victimized bent and broken by systemic racism is up to us. As the documentary's website explains: "THE BLACK PANTHERS: VANGUARD OF THE REVOLUTION is the first feature length documentary to explore the Black Panther Party, its significance to the broader American culture, its cultural and political awakening for black people, and the painful lessons wrought when a movement derails. Master documentarian Stanley Nelson goes straight to the source, weaving a treasure trove of rare archival footage with the voices of the people who were there: police, FBI informants, journalists, white supporters and detractors, and Black Panthers who remained loyal to the party and those who left it...THE BLACK PANTHERS: VANGUARD OF THE REVOLUTION is an essential history and a vibrant chronicle of this pivotal movement that birthed a new revolutionary culture in America." This Connecticut Forum video of Wes Moore and Jessica Williams on different kinds of racism from its Racism Forum is powerful and telling. It is essential viewing! In the words of the Forum, "...Wes Moore and Jessica Williams challenge superficial definitions of racism and encourage deeper awareness and understanding of one another's circumstances." Watch more clips from the Racism Forum's other panelists Morris Dees, founder of the Southern Poverty Law Center, and Antoinio Villaraigosa, former mayor of Los Angeles. It's New Year 2755 on the Karen Calendar! The Karen New Year festivities on January 16, 2016, danced with joy! The day rang in the 10th Annual New Year Celebration sponsored by the Connecticut Karen Community Association of Hartford. The yearly gathering was at the Cathedral of St. Joseph's former school in Hartford's Asylum Hill neighborhood. 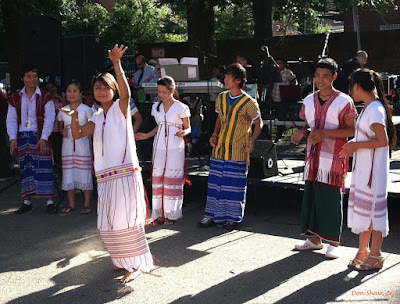 "Since 2008, almost 900 Karen refugees have arrived in Connecticut with most making Hartford their new home city and January 16th marked the start of their New Year," wrote Association official Mr. Soe Naing in a recent Asylum Hill Neighborhood Association (AHNA) newsletter. It is through working with the Hartford Public Library's and AHNA's immigration & refugee welcoming programs that I have come to know the Karen refugees. I was honored to be invited, and to help document the event with photographs. Since 2011 Asylum Hill has been my "home away from home". As a long-time Hartford Area Habitat for Humanity board member and volunteer, I gratefully acknowledge that working in Asylum Hill, especially on South Marshall Street, has had a significant impact on my life. Opportunities to build Habitat homes, support AHNA and Hartford Public Library programs, implement South Marshall Interfaith Coalition initiatives, and work with Hartford Public High School's Academy of Engineering and Green Technology are a sampling of my experiences signaling positive changes ahead for South Marshall Street residents. Please enjoy Mr. Naing's article about the Karen New Year festivities in AHNA's February "News & Views" via this link. When Lare and Batana Bouganou arrived in the United States to build a new life, never did they think they would become pioneers helping to rebuild a neighborhood. Their success has been hard earned. With no prospects for a better life, and living on just a few dollars a day, Lare and Batana secured a rare visa in 2006 to immigrate to the U.S. fleeing the slums of Togo’s capital city, Lomé. Fate brought them to Hartford’s South Marshall Street with what (to them) was the good fortune to rent just a bedroom in a shared apartment in the street’s rundown immigrant and refugee housing. It was the start they prayed for. They found life safer with more opportunities than in Togo. Lare believed Hartford had everything they needed to succeed. “Blessed” with minimum wage jobs, the next seven years led them to their own one-bedroom apartment on Collins Street, the birth of a daughter, and better paying jobs. Lare became a CNA, and is completing courses at Capital Community College for her dream job as an RN. Batana has a steady job at a home products distributor. Their daughter is receiving a great education at the Achievement First Hartford Academy -- all unimaginable opportunities back in Togo. In 2013, the Bougonou’s jumped at the opportunity to return to South Marshall to realize the impossible dream of homeownership. Through their determination to succeed, and with lots of nail pounding sweat equity, they bought a Habitat for Humanity townhome that they helped build -- a new life, a new home. “Every time I open the front door I’m going to heaven,” Lare said wiping her tears. In 2011, Hartford Area Habitat for Humanity embarked on the most technically challenging development in its 27-year history, the construction of 16 affordable townhomes on Asylum Hill’s dangerous South Marshall Street. That question launched the formation of the South Marshall Interfaith Coalition -- a coalition of several Asylum Hill and Hartford area faith leaders uniting to address long-standing barriers to neighborhood improvement. Recognizing the extensive challenges, the coalition knew its efforts, as an unfunded network of faith communities, could not be a go-it-alone endeavor. Other organizations had been focused on these challenges, some for decades. We needed to team with them. With the Asylum Hill Neighborhood Association (AHNA) heading the list, these organizations included The Aetna, The Hartford, St. Francis Hospital, the Marshall House shelter, Catholic Charities Refugee and Immigration Services, the Hartford Public Library, the City of Hartford, The Stowe Center, the Northside Institutions Neighborhood Alliance (NINA), Mutual Housing, Foodshare, Hartbeat Ensemble, the Habitat homeowners association, and, most recently, several South Marshall Street residents. The coalition’s role is clear: Invest in each other and work together. Under AHNA’s direction, the collaboration has increased understanding of the issues facing South Marshall Street residents. Coordinated advocacy has rallied more volunteers and greater resources to support South Marshall’s transformation. Projects include an expanded family-friendly annual block party, immigrant and refugee-welcoming programs, nutrition programs, a playground, urban gardens, improved public safety, and more Habitat homes. While these initiatives hold much promise, long-term success depends on sustained commitment. Transformation of South Marshall has the potential to improve many lives as it has for the Bougonou family. While the coalition is making a difference, it is essential to recognize that important work on South Marshall by some members was underway before the coalition convened. By creating a common table around which to share work and stories, the coalition brought groups together to invest in each other – to come together to build together – improving life on South Marshall Street. It’s a model worth replicating elsewhere in Hartford, and in communities everywhere. This post is a revised version of my article which first appeared in CT Viewpoints on April 22, 2015.